Advice in Scotland 2012/13 is Citizens Advice Scotland’s state of the nation report on the problems that people are experiencing across the country. 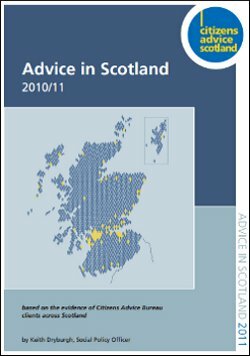 Providing new and in depth information on the hundreds of thousands of people in Scotland who use a bureau for advice every year, this report shows the key problems experienced by clients across the country. 2012/13 was another challenging year for Scotland. Starting with 11,770 families seeing their entitlement to working tax credits end in April, continuing with over 100,000 families losing entitlement to Child Benefit in January, and ending with over 80,000 households receiving letters informing them that they were affected by the ‘Bedroom Tax’ in March. This only tells part of the story, as incomes stagnated, prices rose, payday loans grew in prominence, and food banks began to spring up around the country. As a result of these social changes, thousands of people across Scotland required advice to help them resolve their problems. In fact, the citizens advice bureaux network helped 300,000 clients with over a million issues during the year.